Jason is an Open Source interpreter for an extended version of AgentSpeak – a logic-based agent-oriented programming language – written in Java™. It enables users to build complex multi-agent systems that are capable of operating in environments previously considered too unpredictable for computers to handle. Jason is easily customisable and is suitable for the implementation of reactive planning systems according to the Belief-Desire-Intention (BDI) architecture. Programming Multi-Agent Systems in AgentSpeak using Jason provides a brief introduction to multi-agent systems and the BDI agent architecture on which AgentSpeak is based. The authors explain Jason’s AgentSpeak variant and provide a comprehensive, practical guide to using Jason to program multi-agent systems. Some of the examples include diagrams generated using an agent-oriented software engineering methodology particularly suited for implementation using BDI-based programming languages. The authors also give guidance on good programming style with AgentSpeak. Describes and explains in detail the AgentSpeak extension interpreted by Jason and shows how to create multi-agent systems using the Jason platform. Reinforces learning with examples, problems, and illustrations. Includes two case studies which demonstrate the use of Jason in practice. 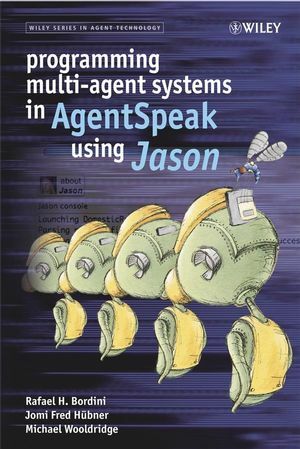 This essential guide to AgentSpeak and Jason will be invaluable to senior undergraduate and postgraduate students studying multi-agent systems. The book will also be of interest to software engineers, designers, developers, and programmers interested in multi-agent systems. 2 The BDI Agent Model. 2.3 A Computational Model of BDI Practical Reasoning. 2.4 The Procedural Reasoning System. 3 The Jason Agent Programming Language. 3.4 Example: A Complete Agent Program. 4.3 Interpreter Configuration and Execution Modes. 5.1 Support for Defining Simulated Environments. 5.2 Example: Running a System of Multiple Situated Agents. 6.2 Informal Semantics of Receiving Messages. 6.3 Example: Contract Net Protocol. 7.1 Defining New Internal Actions. 7.2 Customising the Agent Class. 7.3 Customising the Overall Architecture. 7.4 Customising the Belief Base. 8.2 Declarative (Achievement) Goal Patterns. 8.5 Pre-Processing Directives for Plan Patterns. 9.1 Case Study I: Gold Miners. 9.2 Case Study II: Electronic Bookstore. 10.2 Semantics of Message Exchange in a Multi-Agent System. 10.3 Semantic Rules for Receiving Messages. 10.4 Semantics of the BDI Modalities for AgentSpeak. 11.1 Jason and Agent-Oriented Programming. 11.2 Ongoing Work and Related Research. 11.3 General Advice on Programming Style and Practice. A.1 EBNF for the Agent Language. A.2 EBNF for the Multi-Agent Systems Language. Programming Multi-agent Systems in AgentSpeak using Jason Visit for links to the software discussed and teaching resources.